MAHWAH, N.J., and HERZLIYA, Israel, Jan. 31, 2017 — TopSpin Security, Inc., the leader in intelligent deception and detection solutions, today introduced the industry?EU?s first enterprise internet of things (IoT) security solution based on leading deception technology, now available in the latest version of the DECOYnet intelligent deception solution. TopSpin?EU?s approach overcomes the limitations seen today for IoT security. The company?EU?s unique traffic and security analysis engine enables it to uniquely discover all types of IoT systems in the enterprise. Leveraging the ability to create the industry?EU?s most diverse set of deception traps, TopSpin can emulate enterprises?EU? unique IoT systems for attackers to find, resulting in a tripped alarm and alerts to IT. The new solution will be unveiled and demonstrated publicly for the first time at the RSA Conference 2017, Feb. 14-16 in San Francisco, in TopSpin?EU?s Booth Number 4715 (North Hall). AUSTIN, TEXAS, January 31, 2016 — CodeLathe announced today the immediate availability of FileCloud 14.0, the IT Industry’s fastest growing Enterprise File Sharing and Sync platform. This new version offers seamless document editing capabilities, powerful file analytics and admin reports to enhance collaboration, productivity and enterprise data security. ?EU?Browser based document editing is one of the most requested features by our customers and FileCloud 14 fulfills that longstanding need. FileCloud is the industry’s first Enterprise File Sharing and Sync solution to bring browser based document editing to on-premise file servers. For customers who are looking for an open source approach, we also offer integration with Collabora’s LibreOffice Online Suite?EU? said Amar Kanagaraj, CMO of CodeLathe. FileCloud 14 integrates with Microsoft Office Online Server and Collabora’s LibreOffice to bring seamless browser based document editing capabilities. Users can select any file stored in FileCloud, open it on Office Online Server or LibreOffice Online, edit it and then save it back to FileCloud without ever leaving the browser. This industry leading integration supports Microsoft Office document types (.docx, .xlsx, .pptx) and Open Office document types (*.odt, *.odp and *.ods). This powerful functionality is a boon for organizations that have a lot of files stored on their private file servers behind a firewall. Working with remote Office files has never been simpler. More details on FileCloud and Office Online can be found at the company’s website. Let me set the scene for you. As I mentioned just a short while ago, I’ve got an Audi A4. It’s an entire decade old and I’ve absolutely nailed it into the ground. I’ve not taken a great deal of care of it and have failed to service the thing for many, many years in a row. I’m continually staggered by the fact that it’s still chugging along but, somehow, it continues to do so. Before I had a rather huge “STOP STOP STOP” warning, I had an array of pretty lights on my dashboard which I tended to ignore on a daily basis. I ignored some of them for a reason, like the brake sensor which failed after I had my brakes replaced. It shows that the pads are worn, even though they’re new. I also have a light telling me that there’s a bulb out on my number plate, but there isn’t. There’s also a few other lights that were on – one about the EGR valve, another indicating an engine management fault and so on. 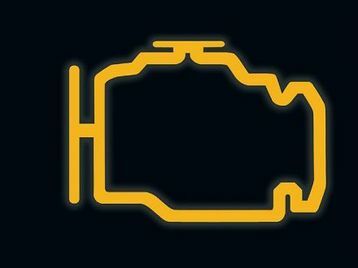 To understand what these lights mean, and what the all-encompassing “engine management warning” LED is trying to tell you, then you could take a trip to your local garage and pay almost £50 just to have a “diagnostic”. Now, this “diagnostic” usually involves some dude with a laptop and a cable. He’ll plug it into your car via something called an “OBD port”. “OBD” stands for an “On-Board Diagnostic System”. You’ll have seen me reviewing tracking and alarm systems (like this CarLock review) which plug into that port to let you know if your car has been stolen. 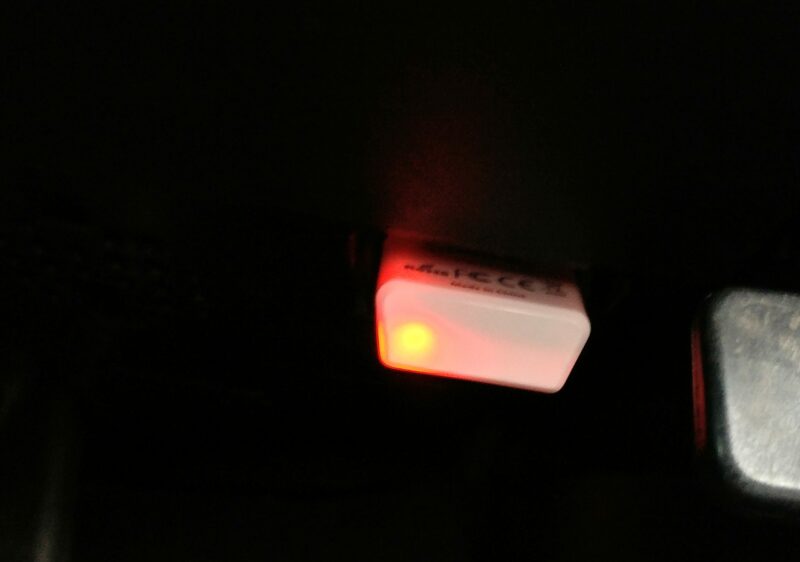 Insurance companies will also offer magical dongles which go into this port to monitor your driving. 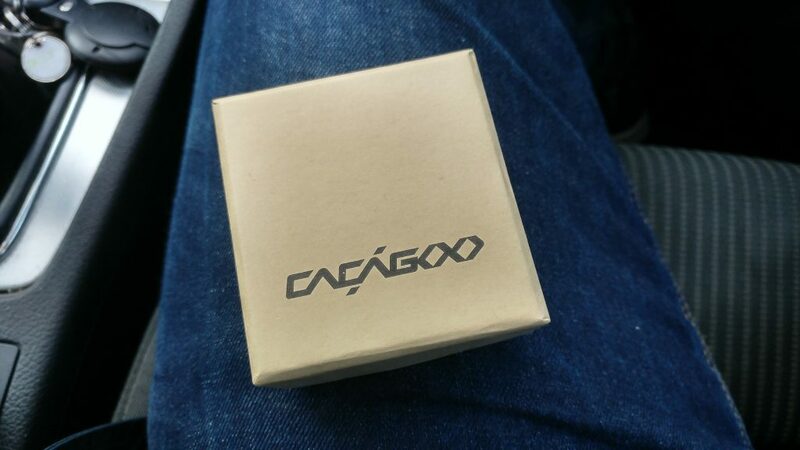 Today we’ve got this CACAGOO Bluetooth diagnostic reader. Put simply, it plugs into your car and you connect to the thing with your phone via the magic of Bluetooth. No cables needed. There’s an array of OBD-II apps on Google Play or the iTunes store to communicate with it and it’ll let you effectively find out what your car is doing. In short, instead of paying Halfords a massive £50 to plug their cable in, you can do the same thing for just £19.99 (or $21.99 on Amazon US) and keep it forever. Out of the box it’ll tell you to install this Mini OBD app (which is also available on the iPhone here) but, if I’m honest, you can choose from a dizzying array of apps – there’s stacks to choose from. So, why would you need this thing? 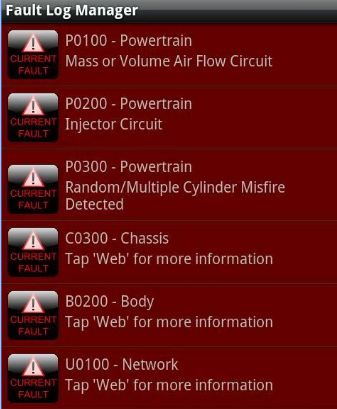 Well, for the “tinkerers” like me, you can actually find out what that error code on your car is. Depending on which app you choose, it’ll let you know what the problem is so that you can go to the garage and say, “It’s insufficient gas recirculation, I’ve had someone read the error code”. Boom, you’ve saved yourself £30-£50 instantly. If you’re an idiot like me you can also clear those error codes and then deny that anything is wrong until something goes “clunk” in the engine and all your oil dribbles out onto the road. Your choice. OK, perhaps I should rephrase that. Let’s say that you want to service your car yourself and reset the service light. You could do that with this. You can also reset the brake warning lights and so on if you choose to swap the pads yourself. However, your car can dish up a whole load more information too. The apps, depending on which one you get, can then display this information as you drive. You can perhaps grab an old smartphone and fix it to your dashboard and have additional information like MPG or engine temperature on display at all times. 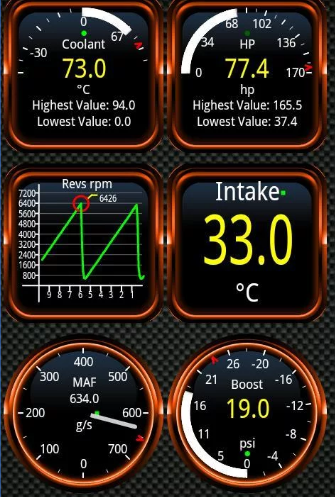 Or, if you want, you can have it showing your speed and engine revs – there’s also apps which will display dashboards to show your average speed and your driving style. 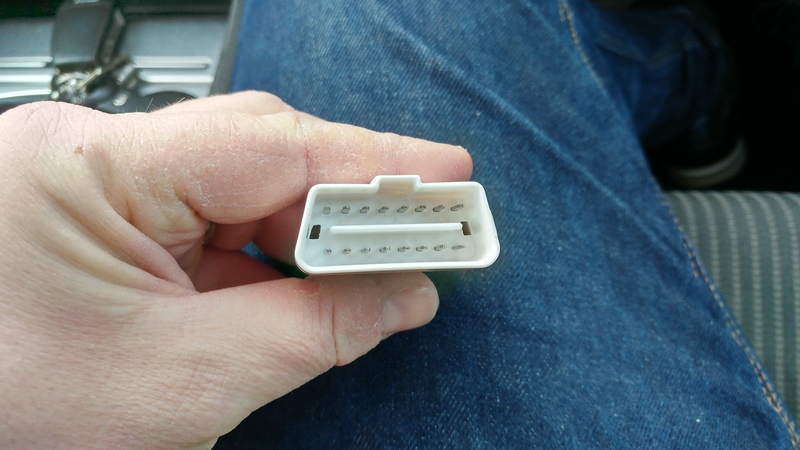 Once you’ve plugged in the CACAGOO (weird name, I know) you simply pair it with your phone and the apps you choose to download can then read OBD fault codes, car performance, sensor data and more. Add the GPS from your phone and you can then get tracker logs which, combined with the OBD engine logging, show how fast you were going, what the engine was doing at the time too. Depending on your car, you can read the dynomometer data, horsepower, torque info, transmission temperatures, 0-60 speed timings, CO2 emissions, turbo readings and you can set alarms and warnings too. 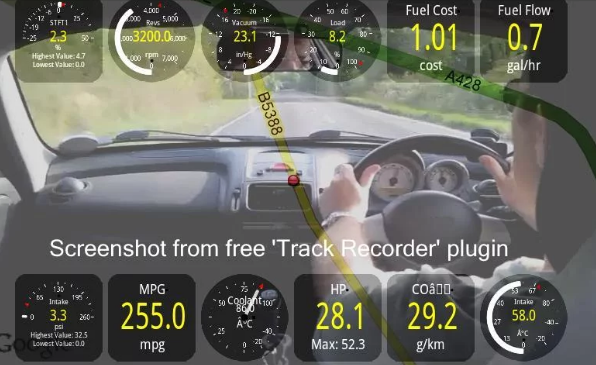 Some apps, like Torque Pro, will let you graph data, and overlay OBDII data onto a video with GPS tagging too. 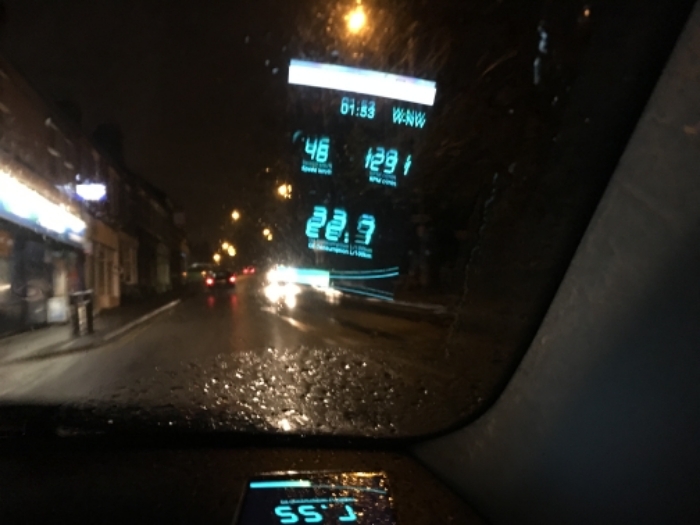 If you decide to stick an old smartphone to the top of your dashboard, you can also have a cheap HUD (Head Up Display) by grabbing data from your engine (speed and revs plus gear selection etc) and displaying it onto your windscreen so that you can see it as you drive along. Apps like DashCommand can also give you trip information, such as drive time, fuel cost, start time, average speed, average fuel consumption, number of stops, braking and acceleration data, distance travelled in each gear and so on. It’s literally like opening a can of worms – you can find out so much information. Right, time for a couple of videos. First, lets have a look at what you can do with this cool little Bluetooth device..
You can also use apps like Carista to alter the way that your car behaves – such as changing the reverse sensor beep or whether you want the doors to automatically lock when you start driving. 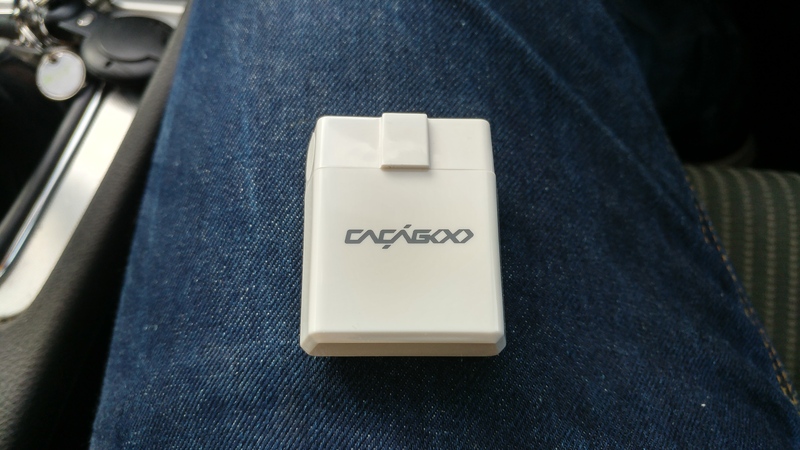 Powered by your car, the CACAGOO Bluetooth diagnostic reader can remain plugged in as you drive and flashes away to show connectivity. It’s powered by your car so you really don’t need to worry about it. Get it for £19.99 on Amazon UK or $21.99 on Amazon US. It’s worked absolutely perfectly for me. It’s small, really easy to install and does the job without fuss. 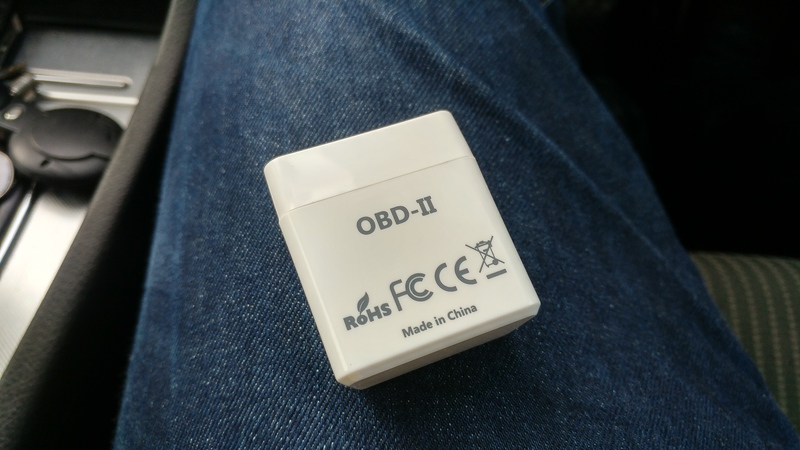 The post CACAGOO OBD-II Bluetooth Vehicle Diagnostic Scanner – Review is original content from Coolsmartphone. If you see it on another news website, please let us know. Remember our BTS08 review from the other day? Well, this is the smaller brother. It’s definitely easier to carry around and is a lot lighter. Likewise, it’s thinner at both ends and I found it pretty easy to fit into a coat pocket. This one, unlike the BTS08, is more suited to a camping trip or similar, but thanks to a large rubber “foot” at the bottom it can also sit quite steadily on a table or desk. It’s available from Amazon US for $29.99 but (as I type) has sold out on Amazon UK. The sound on this, like the bigger unit, is properly good. There’s perhaps not quite as much bass but, at 21.34 x 15.98 x 17.4 cm you’d expect that. 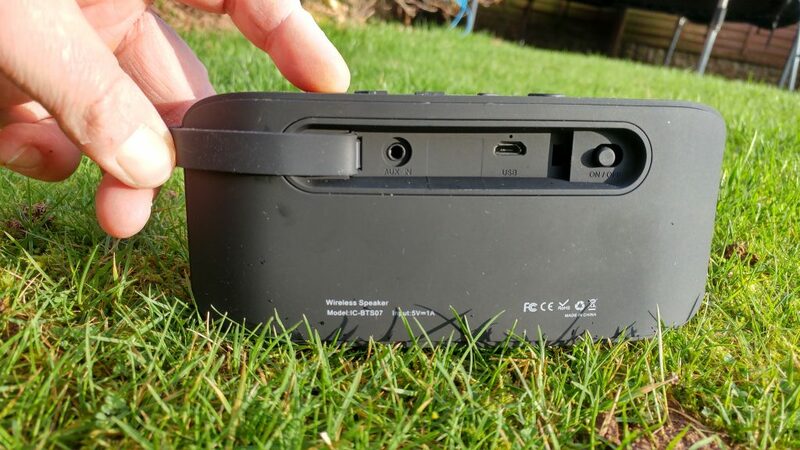 Likewise, there’s two 3W speakers in this (instead of the combined 20W output on the BTS08) and you connect to it via the Bluetooth 4.0 connection or the 3.5mm audio port (hidden behind a big rubber flap). I should mention that, despite the big rubber buttons and the large rubber flap on the rear, it’s not advertised as being waterproof. 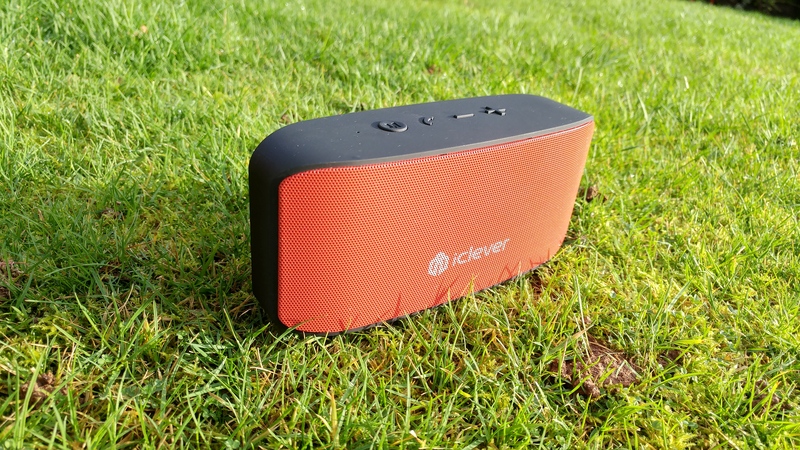 The sound is clear and crisp and, as I’m becoming used to with iClever speakers, there’s no distortion or rattle. It performs well even at the maximum volume and, although it’s not going to blow the pictures off the walls, it’s a solid effort from something of this size. Charged by a microUSB cable (again, behind that flap), the lithium rechargeable battery will keep your music playing for around 10 hours, depending on your volume level. 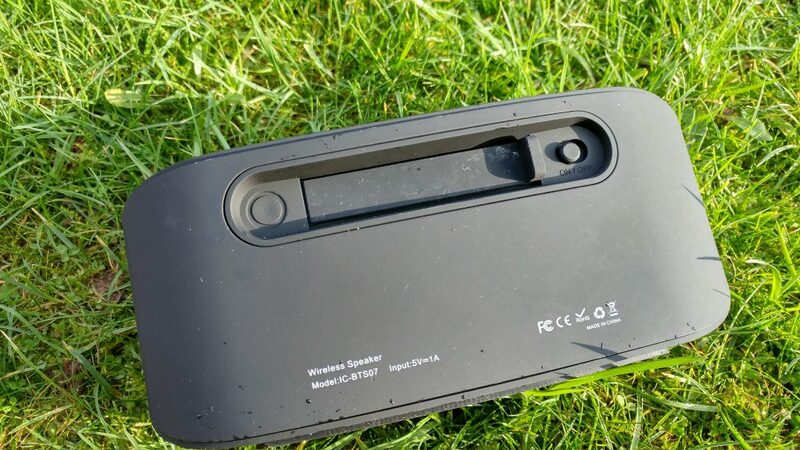 You can of course whack in a portable charger if you want to have it playing for longer – even if you’re in the middle of a field. 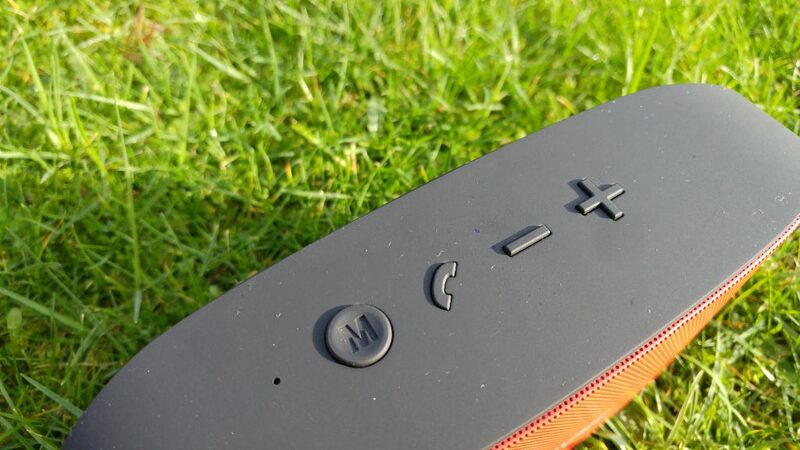 The speaker also comes equipped with a battery-saving auto off function so you don’t accidentally run it dry. Up top, some nice push-button controls let you select the source, increase the volume (this changes the in-built smartphone volume), skip tracks and play / pause. You can also cancel and re-pair from here too. It feels like a solid beast and the mesh surround gives it a sturdy but polished appearance. Compared to other speakers I’ve looked at, this delivers a strong sound with good mid range, clear top-end notes and a fairly good bass response. It’s definitely going to be my speaker of choice if I need a speaker to go camping or to the beach for a picnic etc. A reliable and compact performer from a brand that is earning a fair amount of respect from us here at Coolsmartphone. 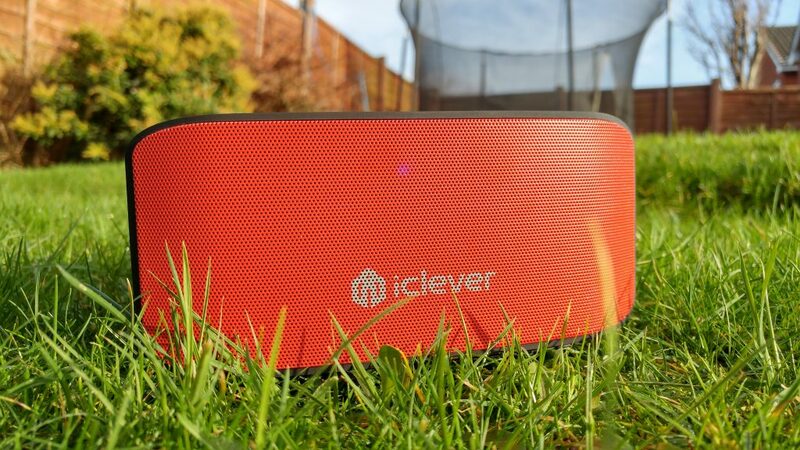 The post iClever BoostSound BTS07 Bluetooth Speaker – Review is original content from Coolsmartphone. If you see it on another news website, please let us know. Let’s be honest, there’s a few places where we use our smartphones quite a bit, and it’s always where we’ve got some “down time”. The smoking shelter outside of work (which has now changed from a horribly smelly place into a huge air freshener thanks to the vape / e-liquid / ejuice that is being smoked instead), the kitchen at work and yes – the toilet. All of these places aren’t exactly clean, and your hands are usually wrapped around some pretty dirty things before or after you use your smartphone. I’ve even heard (albeit on the grapevine) of some employers trying to block WiFi from reaching into toilets because people are spending too much time browsing while they perform their natural “business” on the loo. With all that bacteria on your phone, Japanese company Kyocera has come up with the ultimate solution – a phone you can actually wash with soap and water. The rafre KYV40 smartphone features a screen which can be used with wet hands or with gloves, and you can lather it up under a tap to get it shiny and clean. Not only that, but you can perform gesture controls to completely avoid using the screen – ideal for germophobes (hello Mr Trump). Powered by Android 7.0 (Nougat), it has a 5″ LCD screen and comes with 16GB of on-board storage plus a microSD slot. It also has 2GB RAM a 13-megapixel rear shooter and a 5 megapixel selfie one. There’s no speaker hole on here either. Instead the rafre uses a “Sonic Receiver” to vibrate the sounds to your eardrums, using the display to resonate the sound. The post The new Kyocera rafre KYV40 – A phone you can wash is original content from Coolsmartphone. If you see it on another news website, please let us know. Razer, the gaming hardware company, today said it has purchased Nexbit, the cloud-focused smartphone company. Nextbit’s primary product is the Robin smartphone, which relies on a constantly-syncing cloud connection to manage device storage. The phone was launched through a Kickstarter campaign in 2015 and reached end users in early 2016. Nextbit has updated the core platform consistently over the last 12 months, but has not introduced new hardware. “Nextbit will operate as an independent division inside Razer, focused on unique mobile design and experiences,” said the company in a statement. “To put it simply, we’ll be doing exactly what we’ve been doing all along, only bigger and better.” Nextbit says it has ceased selling Robin smartphones and accessories, but the company remains committed to its existing customer base. Warranties will be honored for the next 6 months, and Nextbit promises to push out security releases through February 2018. “Joining up with Razer will allow us to reach much further,” said Nextbit cofounder Tom Moss. Moss will continue to serve as Nextbit CEO and report to Razer CEO Min-Liang Tan. Terms of the deal were not disclosed. Google today announced the public availability of Android 7.1.2, what it calls a maintenance release. Google is pushing the first public beta of the operating system update to the Pixel, Pixel XL, Pixel C, Nexus 5X, and Nexus Player devices. Google says it is still working on a version for the Nexus 6P. Owners of these devices need only enroll in the public beta program to test the pre-release code. Google says Android 7.1.2 focuses on refinements, bug fixes, and other unspecified optimizations for both end users and carriers. Google expects to test the platform for a couple of months before releasing it to the general public. The update will reach devices enrolled in the beta program in the days ahead. Apple today made a new beta version of watchOS available to developers. WatchOS 3.2 beta 1 includes two core additions to the platform: theater mode and SiriKit. With theater mode, Apple Watch owners will be able to disable sound and raise-to-wake functions while retaining haptic vibrations for notifications. SiriKit, available to iOS since last year, will allow third-party app developers to add Siri features to their own watchOS apps, expanding what Watch owners will be able to do via voice commands. Apple often makes public betas available shortly after releasing developer betas. Developers can download and install watchOS 3.2 beta 1 via Apple’s developer console. Starbucks today announced two voice-driven features that will let people place orders by speaking rather than typing. Both tools rely on the Starbucks Mobile Order & Pay functionality within the mobile application, which makes it possible for people to place orders via their mobile device before they arrive at their favored Starbucks location. First, the My Starbucks Barista relies on artificial intelligence so customers can order and pay for food and beverage items by speaking the request aloud in the Starbucks mobile app. The messaging interface accepts speech or text input and can handle complex tasks such as modifying beverages to meet personal preferences. The My Starbucks Barista feature is being rolled out to a very limited number of iOS beta testers now, but isn’t expected to see a wider rollout until the summer months. Starbucks said the feature will reach Android devices later in the year. Second, the new Starbucks Reorder Skill for Amazon Alexa lets people order their “usual” drink or food item from Starbucks by saying, “Alexa, order my Starbucks.” People will need to program the skill, with their favorite drink and preferred store, in the Alexa app on their mobile device. It will then be available to any Alexa-powered device, such as the Amazon Echo or Echo Dot. The Alexa Reorder Skill will be made available in the days ahead. There was plenty to be angry about this weekend — and many people were extremely irate about the ride-hailing company Uber. The reaction to Uber?EU?s strikebreaking was swift. #DeleteUber began trending, as people encouraging one another not only to delete the app from their phones, but also to cancel their Uber accounts. Thanks to the company?EU?s many controversies — from its attitude to consumer safety to its use of s urge pricing during the Sydney siege — it was far from the first time the company had been excoriated on social media. However, the hashtag?EU?s popularity demonstrated how American consumers are using a different tactic to show their displeasure with what they view as Trump-supporting companies.